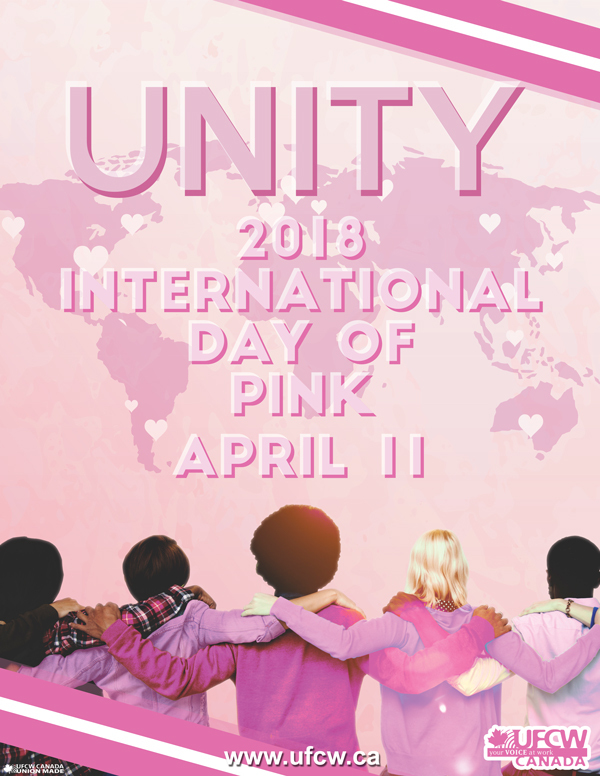 Toronto – April 9, 2018 – As Canada’s leading union, UFCW is proud to support this year’s International Day of Pink, held on April 11. The Day of Pink arose when two students attending a high school in Nova Scotia saw another student being bullied because he was wearing a pink shirt. They decided to mobilize other students at the school and ended up creating a movement where students across the country – and now around the world – wear pink shirts to school in solidarity against bullying. The anti-bullying event has now become an internationally observed day celebrated on every second Wednesday in April. The ask is simple: wear a pink shirt on April 11 and show your support against bullying, discrimination, homophobia, and transphobia. You can also take pictures in support of the Day of Pink and post them on your social media accounts to show that you stand against all forms of bullying and hate. In the workplace, ensure that your colleagues know that no one deserves to be discriminated against and that your union is here to help. When we take a collective stand against bullying in all its ugly forms, we protect each other from the forces of hate that seek to divide us. For more information on the Day of Pink initiative, click here.